It has been far too long since I've posted about organization! Today I want talk about digital organization: your bookmarks. Often as I am browsing the web I stumble upon articles and resources that I want to save for later and bookmark them. It doesn't take long to amass a good amount of bookmarks that can get out of control causing me to spend more time looking for what I want to refer to than actually reading it. So, I've come up with a method to organize bookmarks to allow you to find exactly what you're looking for with ease. Identify what you're bookmarking. By taking a look at the sort of sites and articles you bookmark, you can come up with categories to sort them into. For example, I mostly have bookmarks related to blogging, my classes, career advice, and CA (community advisor, known as RAs at other colleges) stuff. Create folders. I am huge fan of folders; both physical and digital. My mother and I often go back and forth about what sort of organization system is better; piling or filing (the right answer is filing, no doubt, but I'm trying to learn to choose my battles haha). I make a folder for each category, plus an 'unsorted' folder for bookmarks that don't fit into a category neatly. Revisit your bookmarks. It's helpful to go through your bookmarks periodically to clear out anything you don't need anymore. That way when you are looking for something important you'll have less to sift through. Also, this might remind you of a valuable resource that you've forgotten about! Win! 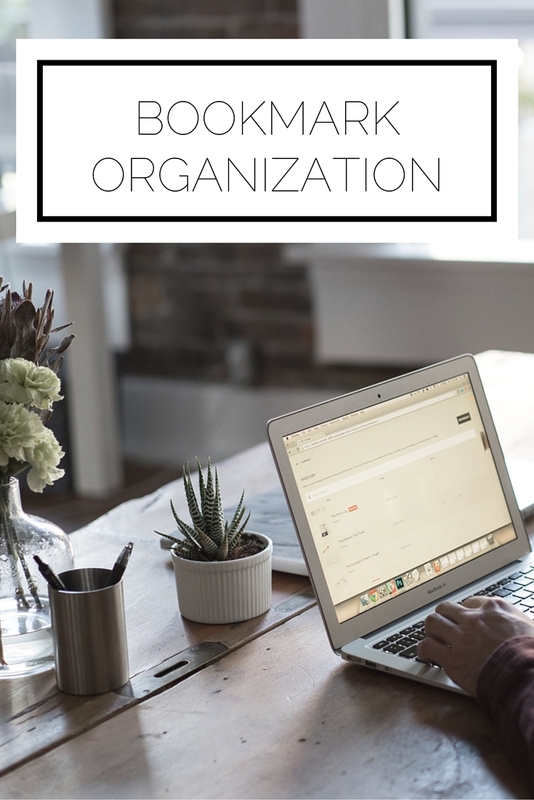 As time goes on if you discover that a new category has come up this gives you the chance to make a new folder and continue your awesome organization. These are the basics for keeping your bookmarks clean and easy to navigate. How do you keep your bookmarks in order? For more organization tips and tricks, click here.